• VIPER weighs 51 lbs. (Excluding front rigging). • New state-of-the-art hydraulic reclining mechanism. • Carbon steel frame with double coated chrome for an attractive, chip-proof, maintainable finish. • Durable, heavy gauge flame retardant nylon upholstery resists mildew and bacteria. 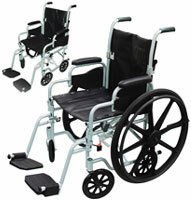 • Nylon, padded armrests provide added patient comfort. • Flip-back arms allow for easy transfer. • Composite Mag-style wheels are lightweight and maintenance free. • Precision sealed wheel bearings in front and rear ensure long lasting performance and reliability. • Standard dual axle provides easy transition of seat to hemi-level. • Composite footplates are durable and lightweight. • Front caster forks are adjustable in 3 positions. • Urethane rear tires and casters offer superior performance, smoother ride and are lightweight. • Comes with push to lock wheel locks. • Comes standard with swing-away elevating legrests.